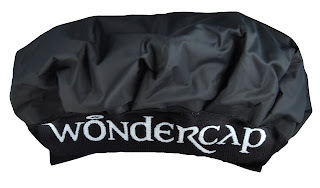 I stumbled across Wondercap on http://www.victoriahealth.com/ and was intrigued to try it as an easy fix for home deep conditioning. I always like to apply heat when treating my hair but faffing about with hot towels and hairdryers can take away from the indulgent aspect. I was sent the Wondercap pack which contains the cap itself, a plastic shower cap and Guardian Angel mask. I thought it was well thought out, particularly the inclusion of the plastic shower cap to contain any mess. Super easy to prepare- simply pop Wondercap into the microwave for about a minute & a half. It stays warm for 15 mins so is timed well to jump in the shower and shampoo hair ahead of applying the Guardian Angel treatment mask. You only need a small amount of Guardian Angel. It's a gel-cream formula provided in a tube for easy application and contains henna to leave hair super shiny. The cap feels quite heavy when first worn but it's relaxing and far more enjoyable to spend the time waiting for your hair mask to work sitting with a magazine as opposed to blasting hair with a hairdryer. It took a while to rinse out the mask, although it's no worse than other products. The treatment left my hair feeling soft & looking shiny, to the extent that friends even asked me what I'd done differently! At £30, I feel it's a reasonable price given that the cap is reusable (it can also be used chilled to help headaches) & compared to the price of other hair mask products. This looks amazing! Thanks so much for this review, will definitely be looking into this!